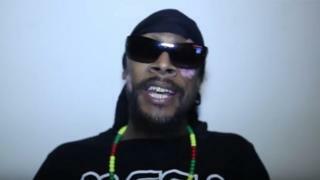 Skepta, Giggs and Devlin have paid tributes to Stormin MC on Twitter. The former N.A.S.T.Y Crew member, who rose to fame alongside Kano, Jammer and D Double E, is thought to have died from skin cancer. The east London artist revealed to fans in 2016 that he had stage two skin cancer, which had spread to his neck. Skepta is among those to pay tribute on social media, writing simply "R.I.P Stormin" alongside a picture of the musician. N.A.S.T.Y Crew are credited as being some of grime's pioneers, finding fame through pirate radio station Deja Vu in the early 2000s. Their songs include Take You Out and Good U Know. Stormin, real name Shaun Lewis, addressed cancer on his album #BRB (Be Right Back), and had been using social media to document how it was affecting him. In January he posted a picture from his hospital bed on Instagram, writing that he could not breathe or swallow properly. The MC got married earlier this month, sharing the video of his first dance on Instagram. In his last post he wrote that he was "staying strong". Musicians and DJs have been celebrating the contribution he made to UK music, as well as his spirit in dealing with cancer. Rapper Joe Grind told Newsbeat: "Stormin was a big part of the genre now known as 'grime' way before it became known as that. "I reached out to him as a fan of N.A.S.T.Y Crew to get a track for the first mixtape SN1 was putting together and the guy spoke to me in such a positive tone like we had known each other for years even though he was yet to hear of me or my team. A nurse who says she helped look after Stormin also paid tribute.